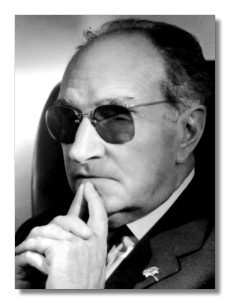 Joaquín Rodrigo (November 22, 1901 - July 6, 1999) was born in the ancient town of Sagunto in the province of Valencia, on Spain's Mediterranean coast. When he was three years old, his sight was severely impaired by diphtheria, and in spite of several operations he later became totally blind. He begun the study of music at the age of eight, and from the age of sixteen was given lessons in harmony and composition by teachers from the Valencia Conservatoire. His first small-scale compositions date from 1923, and his first orchestral work, Juglares, from a year later. After initial success in Valencia and Madrid, Rodrigo moved to Paris in 1927, following the example of his predecessors Isaac Albéniz and Manuel de Falla, and enrolled at the École Normale de Musique de Paris, where his principal teacher was Paul Dukas, Maurice Emmanuel and André Pirro at the Sorbonne. Rodrigo soon became well known as both pianist and composer, and became acquainted with Falla, Maurice Ravel and other musicians active in Paris at this time. In 1933 Rodrigo married the Istanbul-born pianist Victoria Khamhi, who became an important collaborator in many of his compositions. The Rodrigos lived and worked in France and Germany during the later part of the decade, while the Spanish Civil War ran its course, returning only briefly to Spain in the summer of 1938. 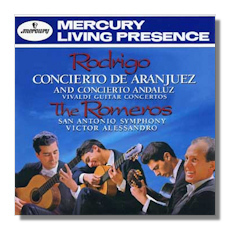 On their definitive return to Rodrigo's native country the following year, two days before the outbreak of World War II, Rodrigo was carrying with him the completed manuscript of his first concerto, composed in Paris the previous winter and spring, the Concierto de Aranjuez, for guitar and orchestra. It was the work which would eventually bring him world-wild fame.